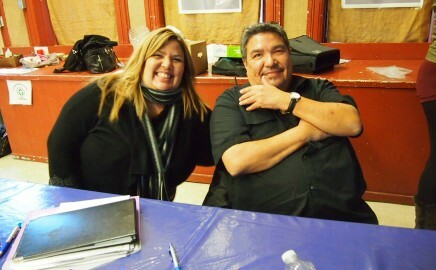 It is with pleasure that I welcome Ramona Sault, Chippewas of the Thames member, to the Clench Fraud Trust. Ramona comes to us from Ska:na Family Learning Centre in Windsor with knowledge and experience in community development, strategic planning, proposal development, policy and program planning, workshop facilitation and conference coordination in the Early Learning Field. She also brings board experience as Treasurer of the Board of Can-Am Indian Friendship Centre overseeing the fiscal management of a non- profit charitable organization to her new role as General Manager. Please help me in welcoming Ramona to our community. The Barn Quilt Trail Project makes use of funds as per section pertaining to history and culture in the CFT trust agreement. 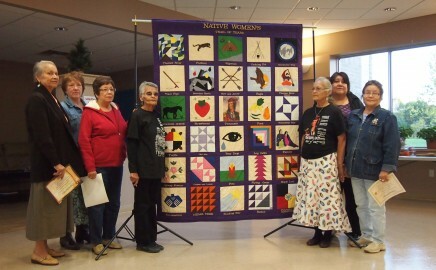 CFT is pleased to support increased awareness of Chippewa history and culture. 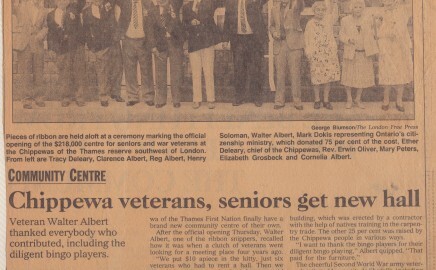 This clipping is from the London Free Press from the 1980’s (exact date is unknown) reporting the grand opening of the Veteran’s and Senior’s Building. This building is now the home of the Clench Fraud Trust. 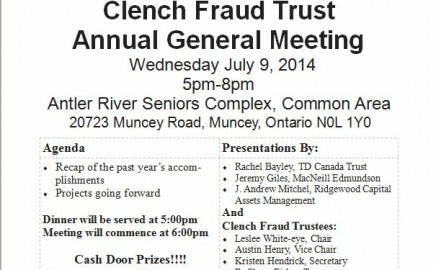 The Clench Fraud Trust held the 2014 AGM at the Antler River Complex (Senior’s Centre). Just over 40 members were in attendance to go over the 2013 Audit, Annual Report, Trustee Roles and Duties, and Investment Report. Over 20 + cash prizes were awarded throughout the evening. Chippewas of the Thames First Nation is home to the Thunderbird Trust formerly known as Clench Fraud Trust (CFT). We are a community trust responsible for the financial management of the proceeds coming from the Clench Fraud Trust Land Claim settlement. We are Anishinaabek Ojibwe and come from a proud heritage.